Your email signature is more than just a formal gesture. It’s a virtual business card that provides a strong connection between you and your customer. It is your silent salesman. But most people overlook the advantages of this simple tool. Even though the rules have changed now that mobile phones have taken over the market, many email signatures have remained the same. Open your email program. Look at your signature. Are you using it to your advantage? Or are you scaring your customers away? Do You Scare Email Customers Away? A friendly email signature can entice customers to visit your website. It could encourge people to follow you on social media such as Twitter or Facebook. It could increase sales, or increase your professional appearance. It could scare customers away, and it can even annoy your customers. Did I say annoy your customer? Believe it or not, I did. Let me give you a few examples. Ms. Johnson is a successful businesswoman who works with both American and international clients. She enjoys placing quotes at the end of each of her emails. However, she does not realize that the quotes are interpreted differently when translated. Jeff is a disaster recovery expert. He communicates regularly with all of his customers, but he signs all his emails “Thanks, Jeff.” None of his email contain any contact information, and he forgets to check his email when he travels. In times of emergency, it may be hours before Jeff can be reached. Customers have to search Google or rummage through their desk to find his business card to contact him. Mrs. Martin sends a V-card that appears as an attachment to each of her emails. All of her contact information is on the V-card, not on her signature. This causes two problems for her customers. First, most customers will not open the V-card because of the risk of viruses and trojan horses. Second, mobile phone users don’t want to juggle pictures and dialing the phone. It’s like doing a backflip on a high wire. If your email signature is customer friendly, you could potentially outperform all of these vendors. Why Do You Want to Change Your Signature? It is very important to make changes to your email signature. You want cell phone users to be able to read your signature, and you do not want to alienate the rest of your users. In addition, you want people to be able to contact you, and you want to make it easy for people to buy from you. Maybe you can even increase your followers. How Do I Improve My Email Signature? To change your siganture, go into your email program and create an automatic signature. Add it to both your outgoing messages AND your reply messages. There is some controversy about whether these messages should be the same or not. My outgoing message is exactly the same as my reply message. Some people set up a short version for their reply message, but if a customer needs your information, why not make it easy? 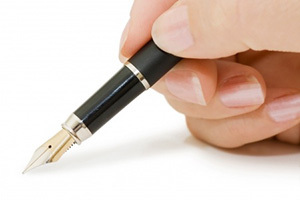 First, place a “– “ between the body of your email and your signature. This is standard practice. Make sure there is a space after the two hyphens. If there is no space, it may be rejected by some software programs. In the EU, you must include your business address. In the U.S., follow my recommendations below. Only include information that you need. Remove the sentence that says “Sent from my iPhone.” It’s pretentious. Change this in your phone under Settings. Skip fancy graphics, dancing jellybeans, and v-cards. They are slow to load, the middle choice is unprofessional, and no one likes the v-cards—seriously. Attachments increase the risk of viruses and trojan horses, and cell phone users won’t be able to read any of those anyway. Always test your signature on several types of email hosts, browsers, and devices. Test your email on Hotmail, Yahoo, etc. Open them in Internet Explorer, Safari, FireFox and Chrome. And try to open these with different types of phones. I’m sure you have friends and colleagues with Windows phones, iPhones, Android phones, etc. Each of these scenarios will appear differently, so see how your signature will appear in each one. Make the appropriate adjustments. Don’t attach quotes or sayings of any kind, even if you really like them. People are funny, and you never know how they might react. Remember that sayings are often known to people from a certain area; people from different locations around the same country, or people from different countries, may interpret your quote in a different way than you expected. Don’t attach legal disclaimers unless you work in a field that requires you to do so. Lawyers, doctors, and bankers are excluded, of course. No one reads them anyway. Remove the antivirus statements at the bottom of your email. They look unprofessional and your customers have their own antivirus software. If you don’t want people to call you on a particular phone number, then don’t use it in your signature. Apply the same rule to the rest of the information in the email signature. Leave out your mailing address unless you have a store front or people will need to mail documents to you. If you work out of your home, you definitely do not want to include it. Always include your email address. Yes, I know that your email address is included in the top of your email, but it will sometimes be stripped out of the email. Be safe and place it in the signature. It’s also a benefit if your email is forwarded to someone else. You might gain another customer! For your convenience, I have provided an example of my email signature below. Please note that I have followed all of my rules in this email signature. Please follow me on Google+, Twitter, and Facebook so I can share my future articles as well. The secret to success is showing up in Google – Call Grapevine Technologies today! Will Changing Your Email Signature Increase Sales? These tweaks can help your email signature market itself. Test it out; send some emails to your friends and close clients and see if they respond. Test it and see if your new tweaks have increased customer communication, increased communication, made someone hit the like button, increased followers, or sent more new visitors to your site. You can try several variations to see which one works best for you. ← Always Proofread Before You Print!